Say goodbye to all of those on-screen panels and menus. 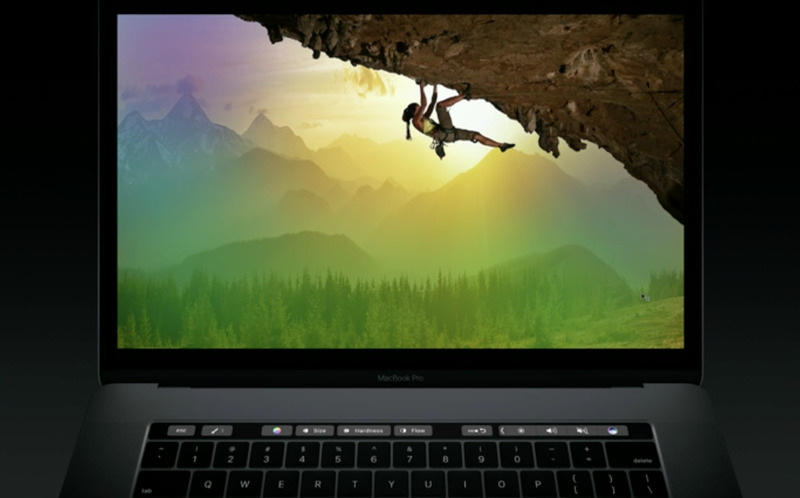 The biggest change in the new MacBook Pro, announced at Apple’s media event on Thursday, is the elimination of the keyboard’s function keys. 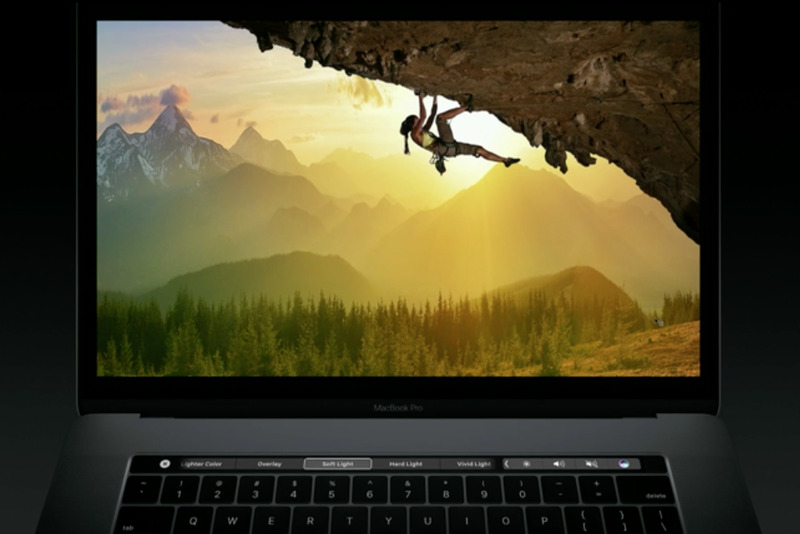 The Pro’s keyboard now has a contextually relevant Touch Bar at the top. 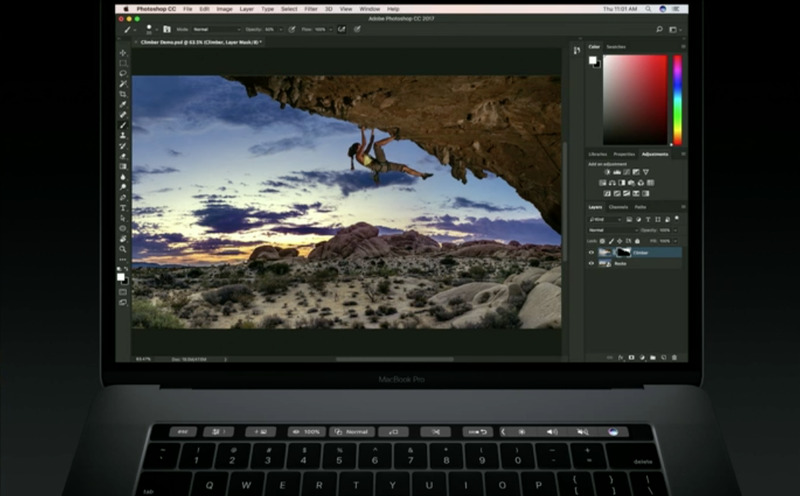 That makes the keyboard more versatile than ever, with keys that change according to the app you’re using. 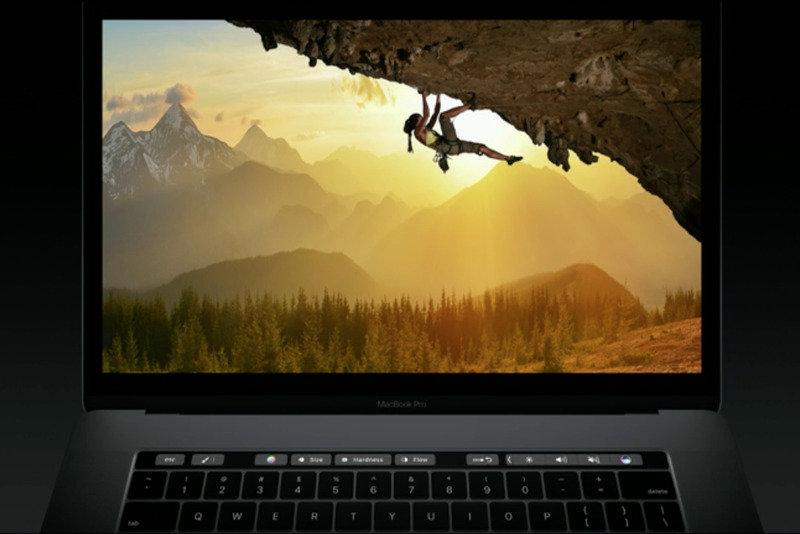 Apple will support its own apps with the Touch Bar, of course, but will also open it up to third-party developers. One of those developers is Adobe, a natural fit. 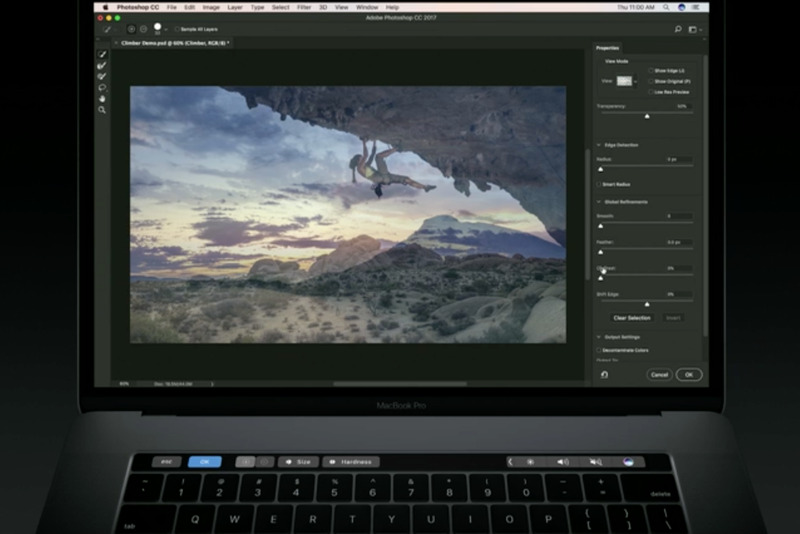 “This new MacBook Pro and Photoshop are made for each other,” Bradee Evans, experience design manager of Adobe Photoshop, said in an on-stage demo at Apple’s keynote presentation. Everyone knows that using Photoshop requires a lot of clicking to achieve the perfect combination of visual effects. 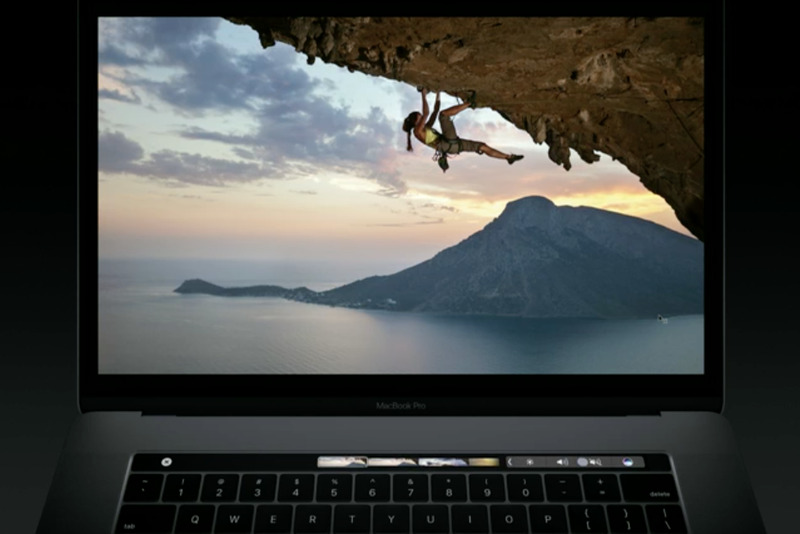 But as Evans demonstrated using a photo of a woman climbing a cave in Greece, the Touch Bar makes that process a little less complicated. “What if the cave were in the desert instead of Greece?” Evans said. 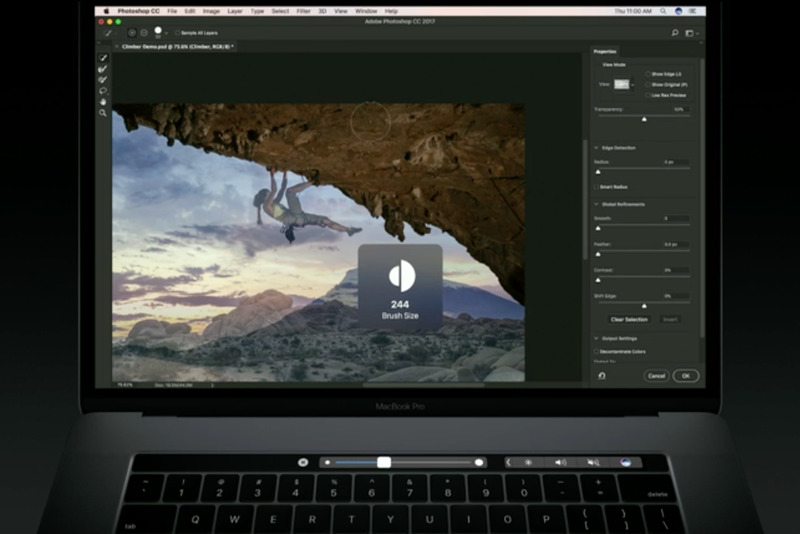 The tool for cutting things out in Photoshop is called Select and Mask. It’s usually buried in a submenu, but with the Touch Bar, it’s right on the keyboard. 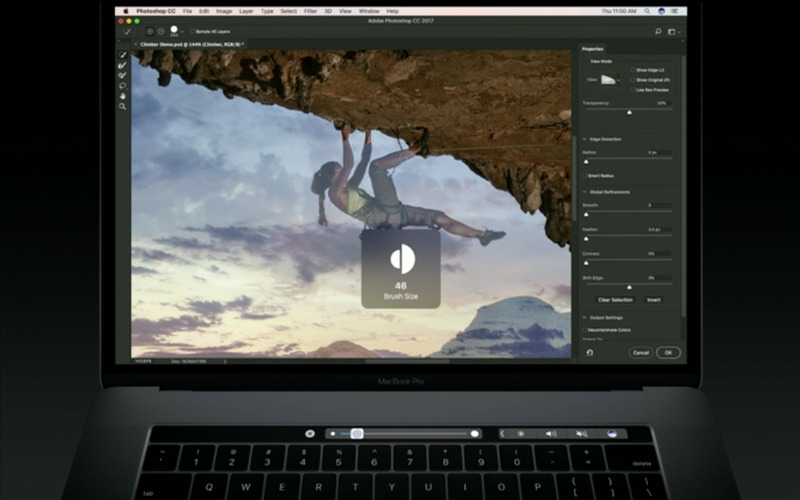 After you touch Select and Mask, the Touch Bar changes again to show you just the tools you need. With your right hand you mouse and select on the trackpad, and with your left hand you adjust the sizing. “This two-hand way of working is really fun,” Evans said. 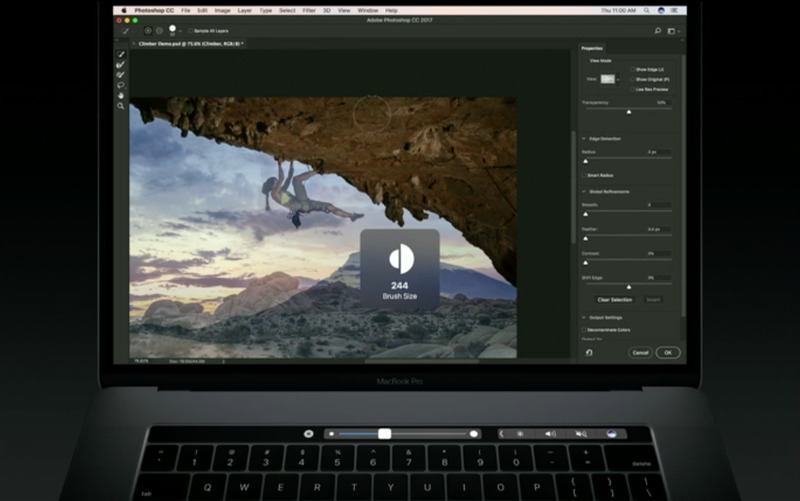 To add to an open document, choose Favorites on the Touch Bar and then add a new layer. You can go full-screen from the Touch Bar if you want—there are no panels or menus to push out of the way. Every option is in the Touch Bar. 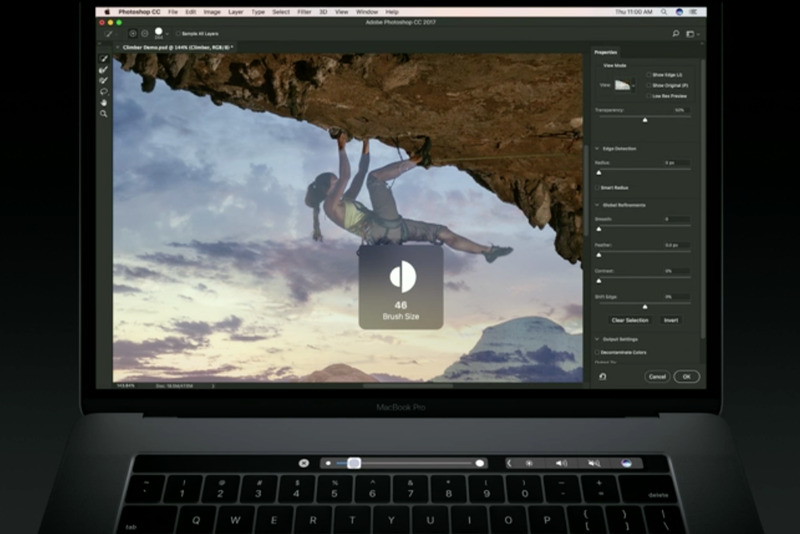 There is a mode of the Touch Bar just for brush control, so you can change the size of the brush, the flow of color through the brush, and how hard the brush is. 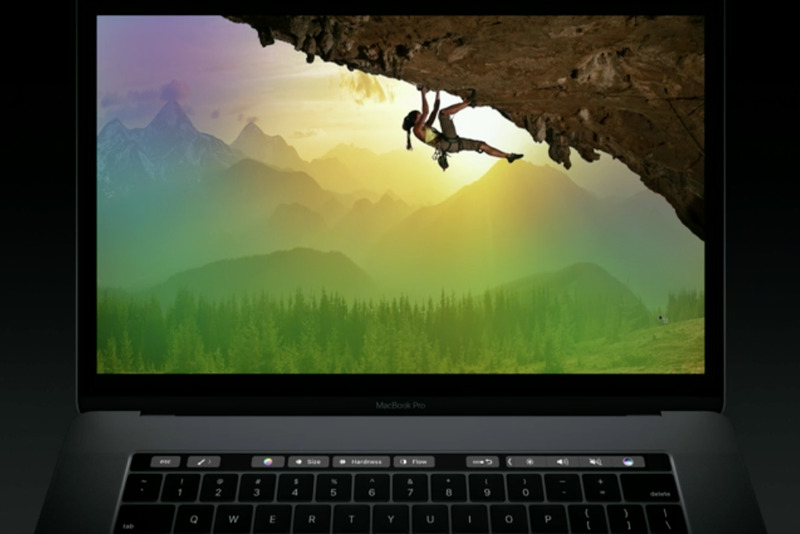 Choosing color is now easier with the Touch Bar. 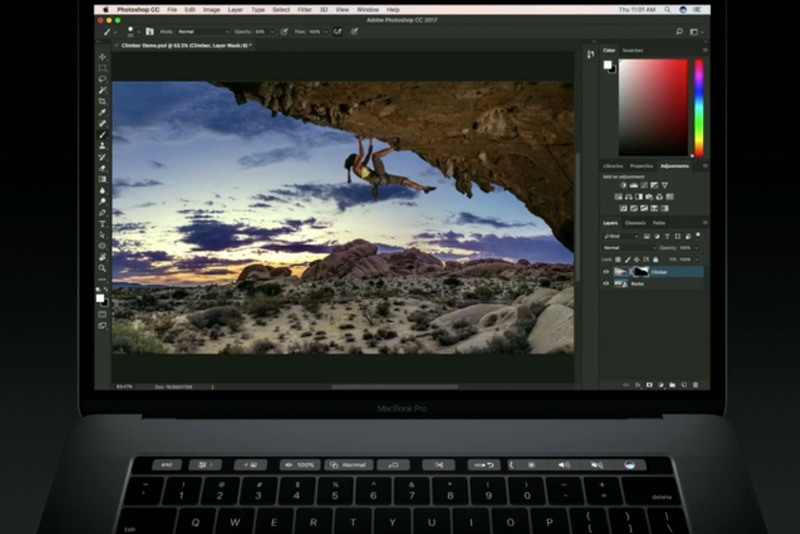 You can keep your right hand on the trackpad—which is now two times larger—for painting while the left hand is choosing colors by sliding across the Touch Bar. “It almost feels like you’re playing a musical instrument,” Evans said. If you want to blend the colors with the layer beneath it, you can change the blend mode in the layer properties. 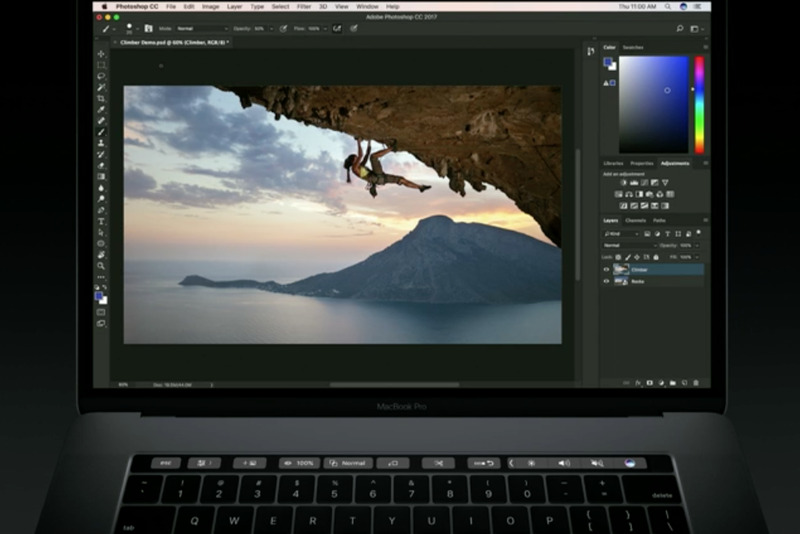 That can be difficult in Photoshop sans Touch Bar. “There’s a lot of clicking and trying and hoping and guessing,” Evans said. 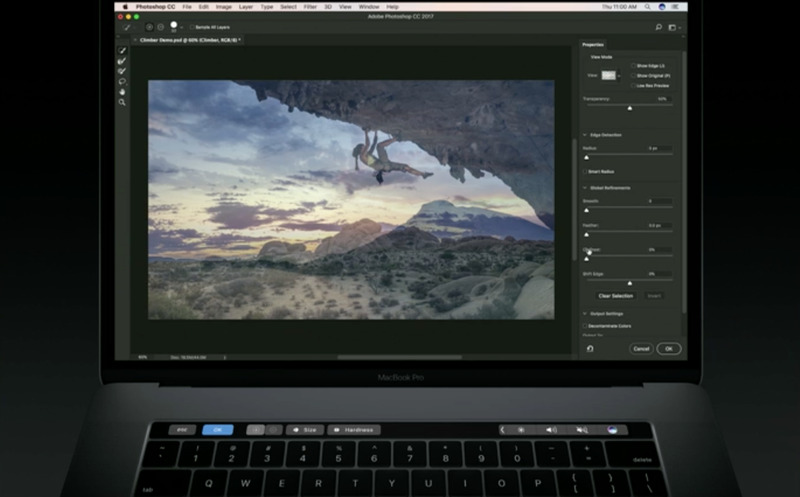 But with the new MacBook Pro, you can just scroll through blend modes in the Touch Bar to find the best one for your image, from soft light to vivid light and everywhere in between. 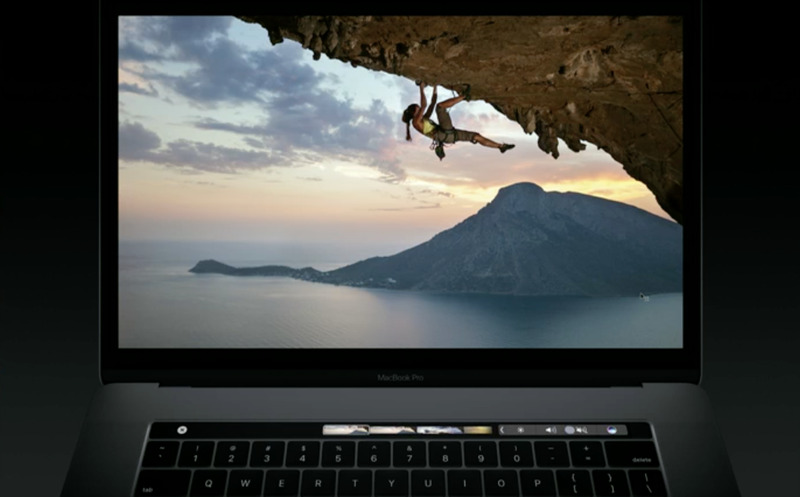 If at any point you don’t like the changes you’ve made, you can scroll back through the visual history of your image in the Touch Bar. The Touch Bar-optimized version of Photoshop is expected to roll out by the end of the year.